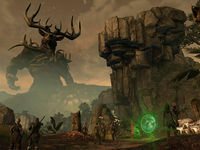 The March of Sacrifices is a part of the Hunting Grounds made to resemble a Tamrielic marshland. It consists of three sections—the Bloodscent Pass, the Whispwood, and the Nightlands, and each representing different time of day. As a hunter passes through through the marsh, they will see a sudden transition from dusk to nighttime, and the flora will change in luminosity from a bright orange to blue to reflect. It is inhabited by Lurchers, Wispmothers, Indriks, and both hostile and docile spectral fauna. Sometime around 2E 583, a Great Hunt was held within the March of Sacrfices. A group of Undaunted assisted Hanu, a Dunmer of the Zainab tribe of Ashlanders, in completing the hunt in hopes gaining Hircine's boon, so that she could free the soul of her father, who was infected with lycanthropy shortly before his death. The Undaunted competed with other hunting parties, but were successful in completing Hircine's task of retrieving the heart of Tarcyr, a formidable Indrik. In the spirit of the hunt—in that the hunter can become the hunted—Hircine offered a rival hunting group led by the Orc Balorgh, a possibly disloyal servant of Vykosa, a chance to earn his boon if they retrieved the heart from the group of Undaunted. The Undaunted faced off against Balorgh, who revealed his Werewolf Behemoth form—an experimental form developed by Archivist Ernarde at the request of Vykosa, that was designed to enhance a werewolf's strength. 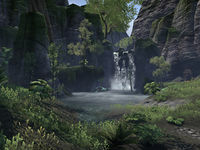 The Undaunted and Hanu were able to defeat Balorgh and to earn Hircine's boon, and Hanu was given the choice of freeing her father from the Hunting Grounds, or herself at the request of her father. This page was last modified on 10 April 2019, at 19:37.